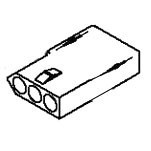 Molex connector housing which uses 0.093-inch diameter connector pins and is polarized to fit together in only one direction. Use female crimp/solder pin # PINF093 (available separately). Replaces Bally/Williams # 5792-09110-00 and others. Crimp and Extractor Tools: See the Wire and Connector Tools section on our Electronic Parts page for tools you can use to extract pins from, and crimp wires into, pins that these housings use.